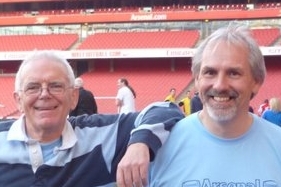 I recently published a little piece on Looking for Arsenal Players as we regularly get emails from readers looking for information about relatives who may have played for Arsenal. The first request we had was for information on Harold James Watson known as Jim, believed to be a goalkeeper playing either in the 1930s or in the wartime leagues between 1939 and 1946. Other information is that he moved to Coventry and played for a works team (perhaps Jaguar or Rolls Royce) and was later a scout for Coventry City. My name is Brian Borgfeldt. 73 yrs young. I live in New Zealand. I have in my possession a badge and gold watch which belonged to my Grandfather. The badge has Woolwich Arsenal F C Director in red white and gold. Presented to Mr J Radford as a token of esteem by workmen at R S F Royal Arsenal Woolwich. 13th Nov 1913.